Make your own ultimate casual jacket, or beautiful evening cover up. Your style will be shown off and your wardrobe enhanced by this completely timeless easy wear garment. Be inspired by Michelle who sells her beautiful handmade kimonos on how to combine colours and textures as a detail and alter the basic pattern blocks to create a completely bespoke garment that will become a lifelong friend. I can personally vouch for how beautiful they are and so easy and comfortable to wear. They’re the perfect garment for showing off great fabrics. Suitable for beginners who have never done any dressmaking. You will make faster progress if you already know the basics of using a sewing machine. There is a choice of 3 dates for one-day workshops 11am-5pm: Sunday 18th September | Sunday 9th October | Sunday 23rd October. OR you can choose to do this class at a 3 session weekly course, 7-9pm on Wednesdays 2nd, 9th and 16th November. 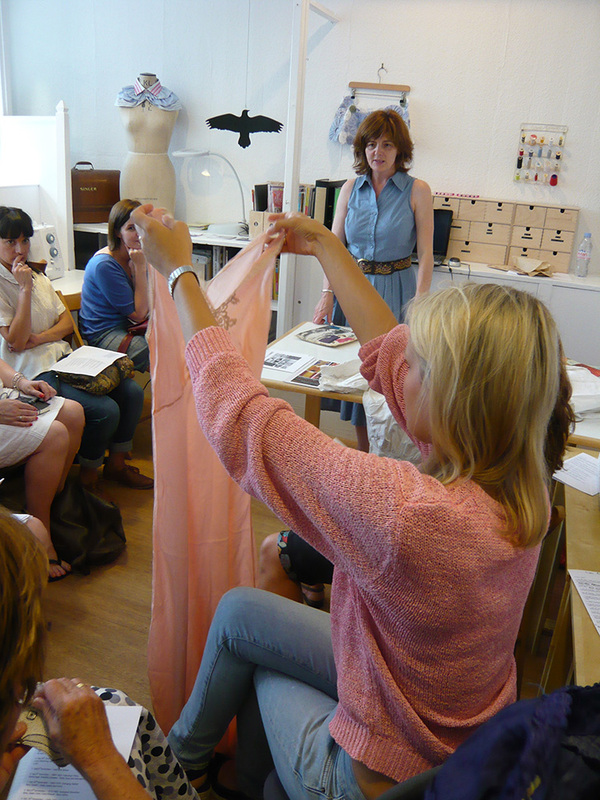 Class size: just 5 people – MIY Workshop offers the smallest class sizes in Brighton, ensuring you will get plenty of 1-2-1 help. A frivolous, fun & flattering piece of underwear you will treasure. A lovingly designed comfortable retro shape with 2 style options. Covers sizes 6-20. Learn a great way to attach frilled elastic neatly and go bonkers with bows! A choice of cotton fabrics, frilled elastics and ribbons is included in the class price for you to create something unique. Price also includes an Anncancan pattern & elastic bundle to take home. There is a choice of 3 weekday mornings 10am-12: Thurs 15th September | Weds 5th October | Tues 1st November. Michelle is an experienced and highly talented maker; as well as selling her beautifully make kimonos, she’s also a freelance costume designer. “Sewing has always been central to my life. From a very young age I remember paper patterns and textiles, strewn across the living room floor. Mum cursing under her breath that the fabric she’d bought hadn’t been cut to grain. I was hooked. Designing and making specialised performance costumes that inspire the artists are a love of mine. Particularly the challenges and problem solving creating them presents. 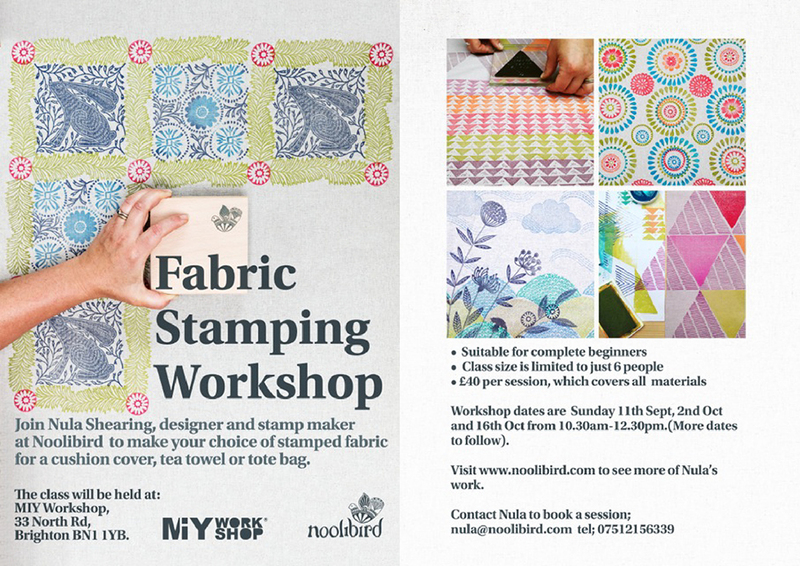 Join Nula Shearing for a fabric stamping workshop where we will be stamping on your choice of a tote bag, a tea towel or a square of fabric suitable to be made into a cushion cover. Nula will bring a variety of her stamp designs featuring geometric shapes, a decorative hare design, and some simple flowers. Nula will take you through the simple steps of inking up the stamp correctly for printing on fabric and how achieve a crisp strong stamped image on fabric. Nula will advise on combining colours together for grey effect, and to match your home decor. There will be lots of stamped samples for you to look at and have a go at recreating for yourself. 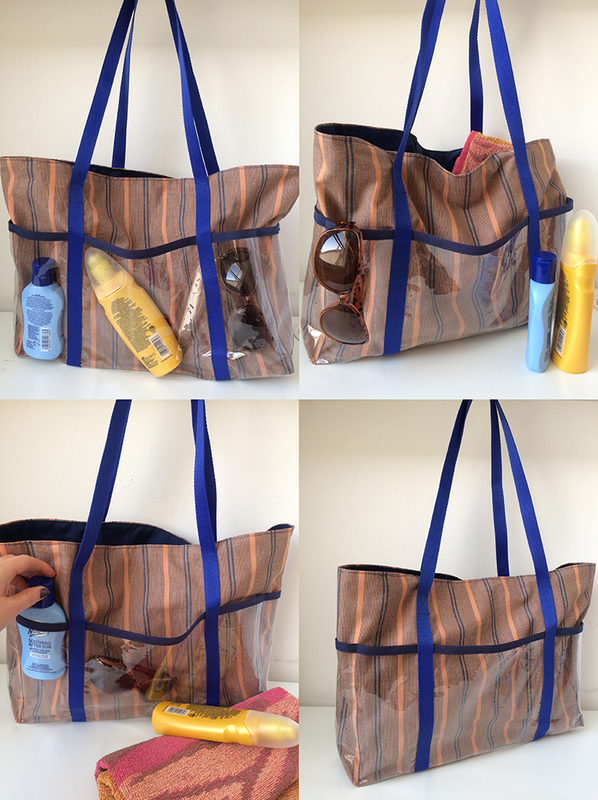 Suitable for absolute beginners – no sewing involved! There is a choice of 3 Sunday workshops: 10.30am-12.30pm: 11th September | 2nd October | 16th October. 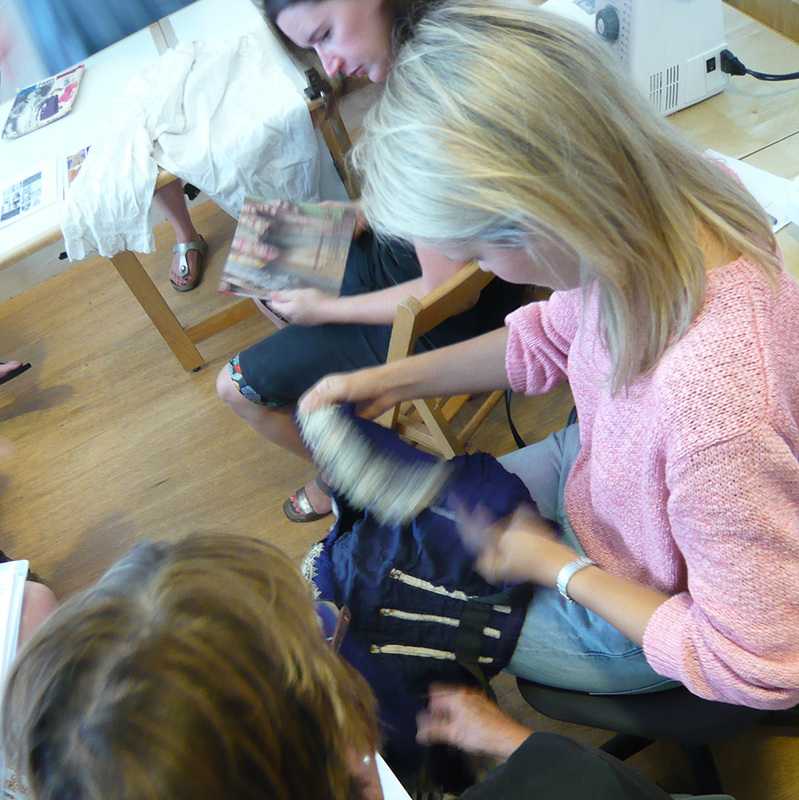 Class size: just 6 people – MIY Workshop offers the smallest class sizes in Brighton, ensuring you will get plenty of 1-2-1 help. I’ve known Nula now for 15 years since we worked together on projects at Gossypium. She is incredibly creative and a very down-to-earth and encouraging person – a great combination in a teacher! 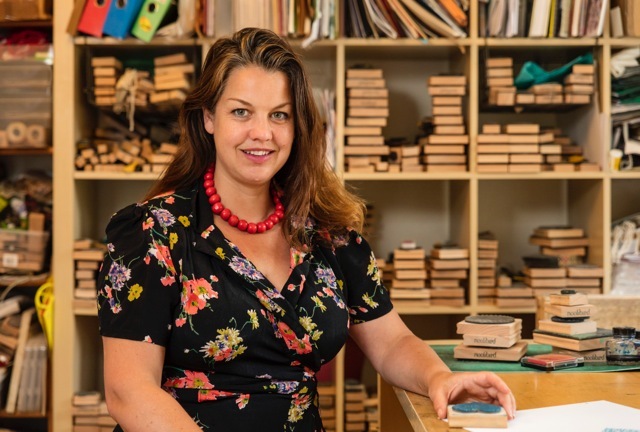 “I set up Noolibird in 2003, being a new mum the focus was then on children’s fabrics and wallpapers. Since then we have continued to evolve and the collection of stamps has grown, often guided by customers requests. My childhood was spent in the beautiful viIlage of Firle in East Sussex with three boisterous brothers and numerous furry friends for company! My Mum and Dad set-up and ran one of the UK’s first mail order businesses Clothkits which was a huge inspiration to watch grow and be a part of … literally, as my brother’s and I and various friends and relations ended up modelling for the brochures! I have no doubt these early experiences helped shape my love of pattern and design and I went on to study textiles at Winchester school of Art, then for 2 years I worked freelance designing prints for fashion for the European, Japanese and American market. From there I was fortunate enough to work full time as an in-house designer for Jane Churchill for three years designing wallpapers and fabrics. Are you guilty of buying an overlocker and never getting it out of the box? Do you have an overlocker and hardly ever use it? Did you buy an overlocker, use it once, then put it away again after you couldn’t figure out the tension? Have you recently got an overlocker and now find yourself wondering why? You are not alone! Bring your neglected overlocker to this class, make friends with your overlocker, take the terror out of overlocking and open up a whole new world of sewing techniques. This workshop is designed for the person who has bought an overlocker and is still somewhat hesitant about using this machine to its full potential. Perhaps the overlocker purchase was a bold idea, but when it was nestled in amongst the other sewing gadgets, it seemed a little daunting and the tasks assigned to the overlocker seemed a little too ambitious. This is a workshop for those who have looked inside the overlocker at all those threads and moving bits and thought that as long as nothing broke, you would be fine with this intrepid machine. Let Deborah help you with your confidence using this machine. After this class you will be able to thread your machine confidently, remove parts of your machine and manipulate your overlocker so that it gives you the desired finish you are wanting to add to your sewing. You need to bring your own overlocker so that you can continue to use it after the class! You need to be confident using a sewing machine and be a fairly confident sewer/dressmaker. This class isn’t for complete beginners to sewing and dressmaking who don’t already confidently know their way around a sewing machine. Class size: just 5 people – the smallest class size to learn how to use your overlocker in Brighton, ensuring you will get plenty of 1-2-1 help and go home confidently able to use your overlocker. “I have been sewing for a long time. Even a long time before it was trendy. I remember being embarrassed to say that my only skill of note was that I knew a sewing machine and I could make that baby sing. But I could, and I still can. I have a fashion design qualification that lends some credibility to what I do and have completed some excellent training with top companies who provide overlockers (Babylock, Viking Husqvarna, Janome). I have also had a number of business projects that have had varying degrees of success (bridal wear, Africa school project, business development, teaching), but I think over and above this, it’s the passion for the craft that lends the heaviest weight. And more than that, I love helping people with their passion for this wonderful skill. 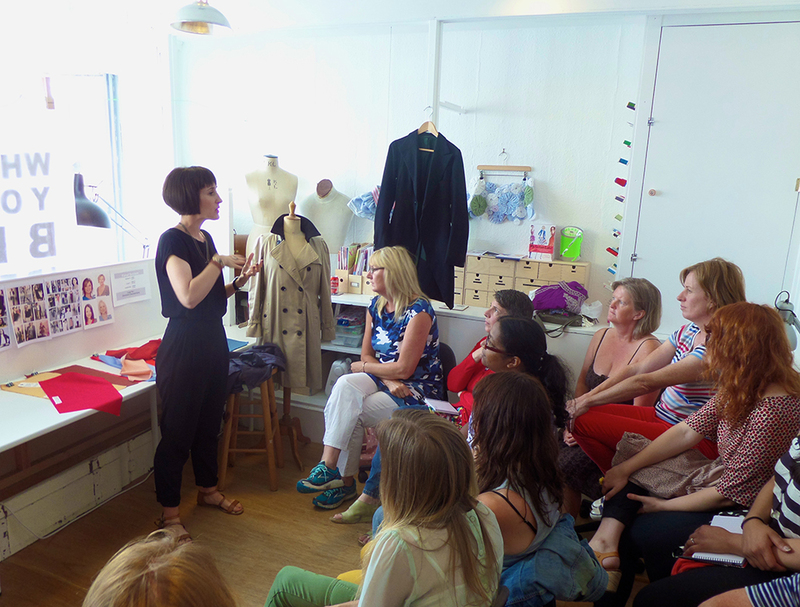 Learn from a qualified and highly experienced industry professional how to use your overlocker at MIY Workshop – a fully equipped specialist design and sewing studio in central Brighton in the heart of the North Laine with everything you’ll need for the day close to hand. 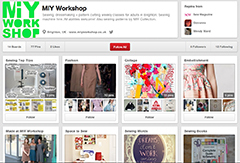 New Patchwork Course at MIY Workshop!! Got loads of scraps of fabric that you don’t know what to do with? I know you do…..! 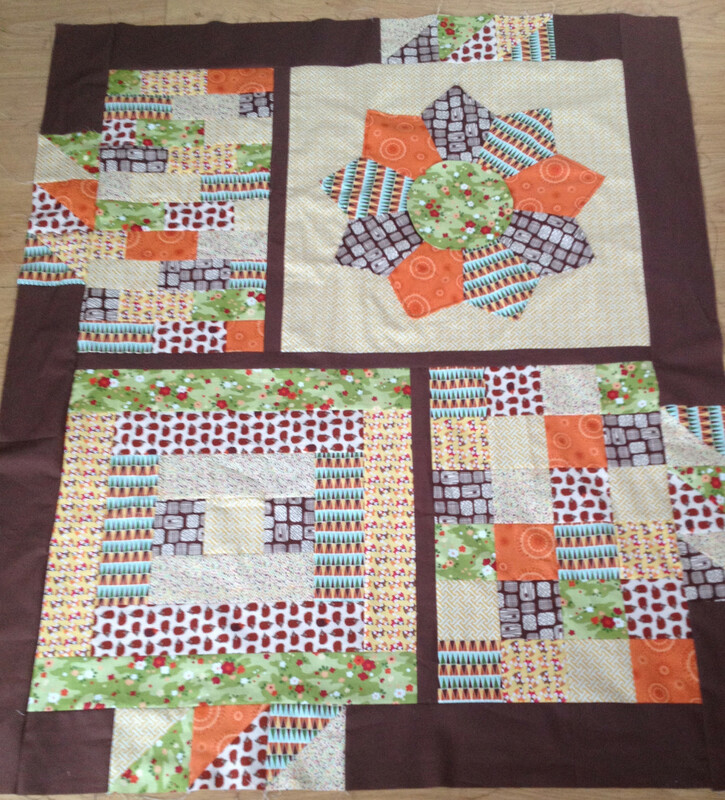 Why not have a go at patchwork? Patchwork expert Liz, author of the excellent “Beginner’s Guide to Quilting” will be running one of her beginner’s courses at MIY Workshop this Spring. Full details and how to book below. This course provides an excellent introduction to using a rotary cutter and using a sewing machine to make a quilt. The quilt is called Tick the Boxes as it ticks lots of boxes of techniques and tips to go on to make beautiful quilts. The finished size of this quilt in class is approx. 1m x 1.2m so a good size lap quilt to go on the back of the sofa. Suitable for beginners and improvers. It may be possible to pay for this course in instalments – ask for more details. All you need to bring is fabric and a sewing kit. A full list will be sent when a booking is placed. For more information or to book email liz@quilty-pleasures.co.uk or book online on the Quilty Pleasures website. 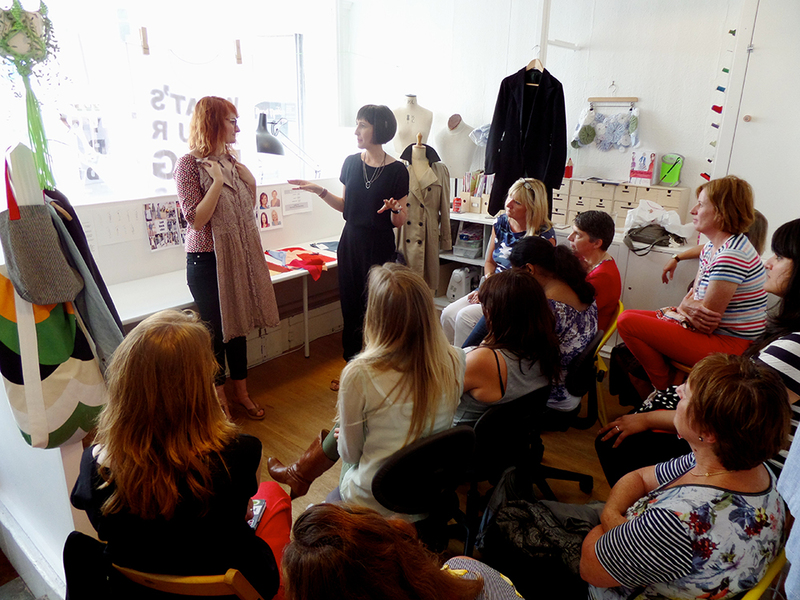 Yesterday’s first Styling talk by Clary Fisher was a great success. Even I left feeling inspired to organise a capsule wardrobe free of “wardrobe irritants” and one of our attendees Michala went home and spent 6 hours decluttering her wardrobe, putting unworn clothes into vac pack storage, collecting clothes for her local charity shop and making herself a pile of alterations to get stitching! An on-the-spot interactive bit where Clary looked at unworn items that people had brought in to try to identify how they could be changed to become well-worn items! And focussed concentration while Clary talked about all the other aspects in addition to clothes – like hair, make-up and shoes and showed the group a collection of inspiring items from her own wardrobe that she has altered and adapted to make work for her. make your clothes work for you – if garments in your wardrobe aren’t being worn, what can you change easily to make them into well-worn favourites? Let’s start thoughtful sewing and thoughtful shopping. So, how many times have you lovingly made yourself an item of clothing and then never had an occasion to wear it? Let’s face it, there are only so many times in a year that you’re going to need a tea-dress/vintage style frock with nipped in waist/swirly skirt with a mad print. What styles best suit your body shape? If you know that full skirts make you look a stone heavier, why spend time sewing yourself one? What colours suit your skin tone and hair colour? If you love to wear bright colours, put that pastel lemon floral fabric back on the shelf! What sort of garments do you tend to feel most comfortable in? You love to wear trousers and very rarely wear skirts, so don’t choose a skirt pattern to make, thinking it’s time you “got into” skirts. What garments and colours do you already have in your wardrobe? 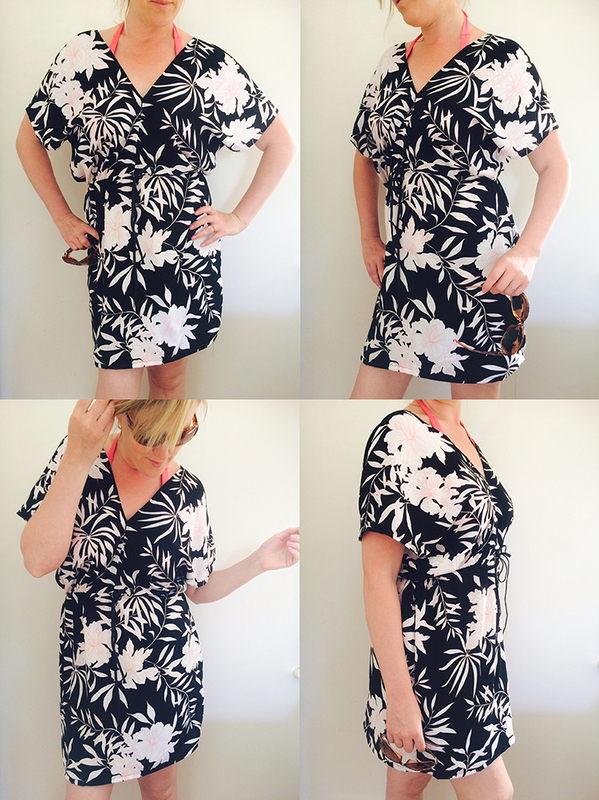 If your wardrobe is full of cold colours, bold prints and separates that mix together well, why are you considering a Hawaiian print shirt dress to wear with flip flops in the summer? Once you’ve got your rational head on, start looking at patterns and fabrics with a fresh and more objective eye. Look at the small line drawings of the design of the pattern and ask yourself if it’s a style you can see yourself wearing. When you’re out shopping for fabric, stop looking at fabric as an abstract thing in its own right (it may as well be wallpaper or a table cloth), imagine great chunks of the stuff draped around your body (grab the roll and hold it up against your face), can you really see yourself wearing it??? 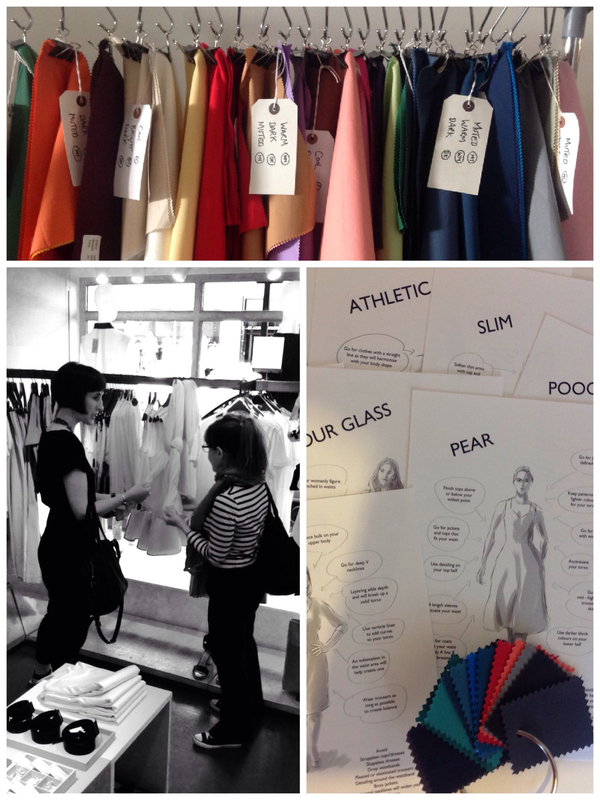 This post has been inspired by a meeting I had recently with personal stylist Clary Fisher. Clary and I had been aware of each other online for sometime, but finally met up over a cup of tea to discuss an idea of Clary’s. Well what a fab meeting and hopefully the start of something rather special, as it was so nice to have a good old chat with someone totally on the same wavelength. sewing doesn’t always save money when compared to shopping on the high street, but it could result in you having a much more wearable wardrobe of things you feel good in. 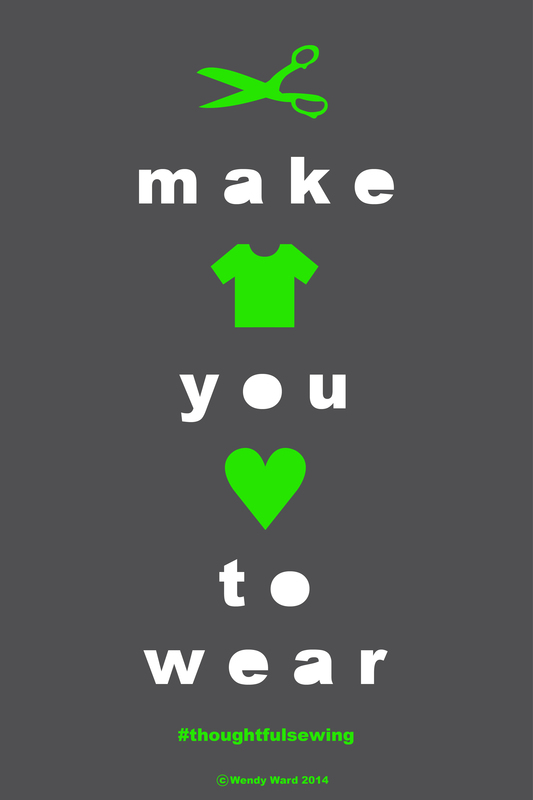 Do you feel inspired to start sewing your “you” wardrobe? 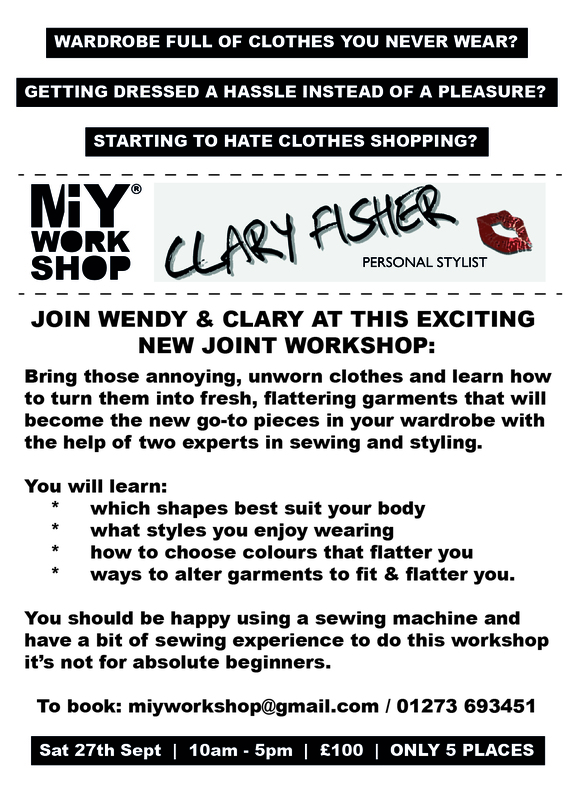 Clary will be giving a talk at MIY Workshop all about styling which will include easy tips to work out shapes and colours that suit you and how to apply that to making something that you will love wearing. We’ll also be announcing some exciting joint workshops soon! Clary’s credentials are impressive, (as you’d expect from any industry professional invited to speak or teach at MIY Workshop) she’s worked as a stylist on West End shows, TV shows including Eastenders and The Mobo awards, for bands and on fashion shows and shoots. She’s also a visiting lecturer at the London College of Fashion and even better, she also knows how to sew having studied tailoring! If you’d like to join us, the date is Saturday 5th July at 11am. ***30/5/14 UPDATE*** – as seats for the 5th sold out in a day (!) we’ve added a second date for Clary’s talk: Saturday 19th July at 11am. Tickets will be just £5 and there will only be 12 seats available. making the clothes you want to wear. Monday evening was the first in a series of talks at MIY Workshop. I’m planning to invite experts and professionals from a variety of areas connected with fashion, textiles and design to give short interactive talks about their work. Suzanne Rowland got us off to a great start with her talk on 20th Century Fashion History. Suzanne started with a fashion degree and had a brief stint as a designer for M&S, but since then has moved into costume and fashion history; she is a freelance costume maker, has an MA in Design History and is teaching costume design with BTEC students. In between all this she is a regular contributor to Making magazine and pursues her own fashion history research attending conferences and delivering papers. 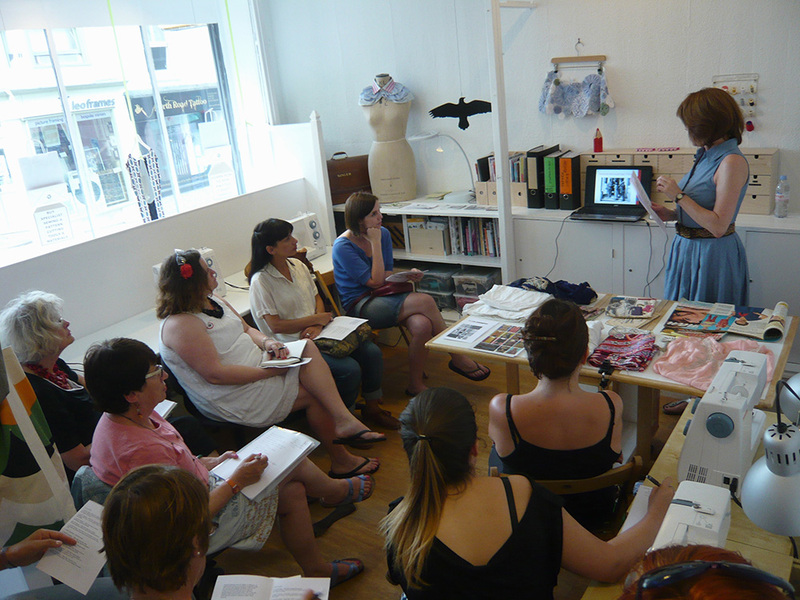 Suzanne’s talk was a whistle-stop tour of the highlights from a 10 week lecture course she has developed on 20th Century Fashion History that will be running at Worthing Museum from the end of September (for full details telephone the museum on 01903 221448, or email museum@adur-worthing.gov.uk). Worthing Museum is a bit of a hidden gem as it has one of the largest collections of fashion and textiles in the country, numbering approximately 30 000! It is also unique in that many of these artefacts are everyday items that belonged to ordinary people. The collection’s particular strengths are in 19th century women’s dress, underwear, swimwear, accessories, smocks and quilts. The collection also covers a comprehensive collection of ephemera and associated material including fashion plates, paper patterns, magazines and photographs. It’s very tantalising to know that you have the opportunity to handle many of these items from Worthing’s archive as part of Suzanne’s 10 week course. Whenever I go to exhibitions of textiles and clothing I almost have to hold onto my hands to stop myself from touching the pieces on display! Suzanne had brought in pieces from her own collection for us to look at during her talk. There was a beautiful vivid blue Victorian bodice/jacket which was admired by all for its inner construction as much as for how it looked on the outside (typical for an audience of makers!). A gorgeous little beaded purse in perfect condition. A beautiful bias cut, lace trimmed night dress from the 40’s. We also ooohed and aaahhed over some bloomers, petticoats, a beaded motif from a flapper dress covered in glass beads and magazines from the 60’s and 70’s. Something I found particularly interesting in a magazine from 1972 was an advert for M&S complete with prices of the clothes……they weren’t that dissimilar to the prices you pay today at many high street shops, over 40 years later. I wonder how many other industries have seen the prices of their products remain static over 40 years?! every Tuesday morning in Lewes Town Hall there is a good bric a brac market from 10am to 1pm. 28/9/13 1900-1910: Elegant Edwardians – Course introduction, starting with Charles Frederick Worth, the “Father of Couture”. 5/10/13 1920-1920: Troublesome Teens – Hardship and Luxury, from everyday wear to Poiret, Fortuny and Lucille. 12/10/13 1920-1930: Terrific Twenties, introducing Chanel and Vionnet. 19/10/13 1930-1940: Glamorous Thirties, art and Schiaparelli, British romance and Hollywood glamour. 26/10/13 1940-1950: From World War II to the New Look rationing, Make do and Mend and the shock of Dior’s New Look. 9/11/13 1950-1960: Fabulous Fifties, Balenciaga, beautiful dresses, Teddy boys and teenagers. 16/11/13 1960-1970: Swinging Sixties, Mary Quant, minis, maxis and more. 23/11/13 1970-1980: Spangled Seventies, Biba, Ossie Clark, Celia Birtwell, disco styles. 30/11/13 1980-1990: Eclectic Eighties, new fashion capitals – London, Tokyo, Milan and New York, Westwood, Miyake, Versace and much more. 7/12/13 1990 onwards: Past Present and Future, street culture, celebrity culture, the rise of Galliano and McQueen. Maybe I’ll see you there! I’ll definitely be booking up for a couple…..
I’m hoping to announce the next talk soon.